Silver Shoes & Rabbit Holes: It's Friday! Whatcha readin'? It's Friday! And what a cold, dreary Friday it is, too. I just finished baking what I thought was 69 loaves of pumpkin bread, but apparently my counting was way off - she picked them up as I baked - and I really baked 78 or something. But that's okay! They ordered 21 more! Yay! As you can imagine, I haven't read as much these last couple of days, but I didn't do a Friday Reads post last week, so I have two weeks of reading to share. Let's start with what the girls and I are reading together. The last two nights, we've taken a break from the wonderful Patchwork Girl of Oz to read the second Betsy-Tacy book! Original edition published by Thomas Y. Crowell Co., 1941. Reprint edition by HarperCollins, 2000. 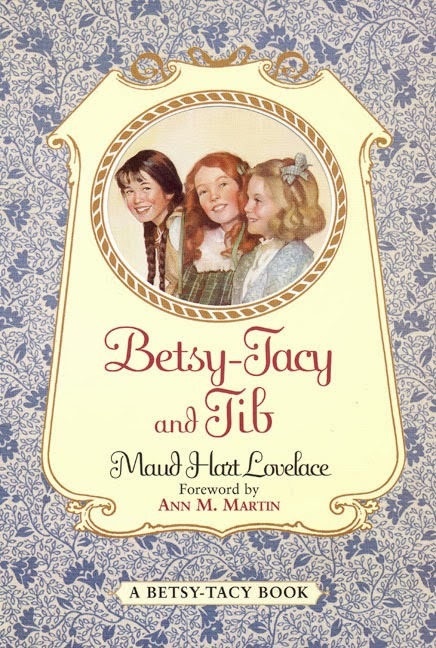 We "read" Betsy-Tacy via audiobook on our trip home from Oklahoma last month. The amazing Sutton Foster did the reading, and I asked the girls if they would like to continue the series on audio at home. "No, we want you to read it." Really? They prefer me to Sutton Foster? These books are so warm and cozy. I had never read them before, although I learned a lot about them through one of the Mother-Daughter Book Club books, Home for the Holidays. The girls are enjoying this one very much. 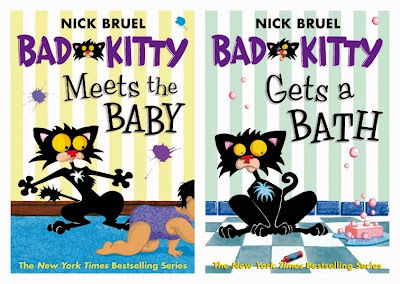 I haven't read any of the Bad Kitty chapter books, but apparently they're hilarious. Big Sis rips through them quickly, as they're easier and heavy on the illustrations. They certainly look funny! It was quite a coincidence when she started checking these out, as I had just read this over at Pen Pals & Picture Books! Here is the book trailer for Bad Kitty: School Daze (2013). by Barbara Park, illustrated by Denise Brunkus. Random House Books for Young Readers, 1994. So, so funny. Big Sis had read it before, but it was new to Little Sis and me, and we laughed and laughed and laughed. I'm so excited, because next month, the children's theatre is doing Junie B. in Jingle Bells, Batman Smells as part of their Once Upon a Time series for little ones. Now what have I been reading on my own? Grown-up books! Really! I'm trying to rush through books on my shelves and in the library bag, before I devote the rest of the year to my holiday/seasonal binge-reading. I had ordered the next two novels by Sarah Addison Allen soon after completing her first two, both of which my mother had given me. "You love Alice Hoffman, you love southern fiction. You'll love these!" Yes, Sarah Addison Allen definitely still reminds me Alice Hoffman, but Hoffman at her most magical, literally and/or figuratively: Practical Magic, Seventh Heaven, The River King, The Probably Future... I really enjoyed this one. I liked the characters, particularly Julia. I'm still not sure what I thought about the magical twist, which I can't give away, but which did verge on cheesy. The tale was told so well and the characters were so appealing, I let it go. The Peach Keeper was especially wonderful. The characters draw you in, the descriptions of the southern town and its social history put you into the story. This one might be my favorite of the four. After completing these literary excursions through the Deep South, I ventured to Australia and England via Kate Morton's The Forgotten Garden. I have an advanced reader's copy of Morton's first book, The House at Riverton, which sounded promising. I read it and didn't care for it. I know this, because I had to struggle to even remember the story. That will not be a problem with The Forgotten Garden. I loved this book so much, I regaled poor Mr. B with the entire storyline, and it's a very layered storyline. The book jumps through time periods and characters, telling the story of a woman who finds out on her 21st birthday that she isn't who she thinks she is. She was found alone in Australia on a ship from England when she was four years old. The book is about her search over the years to discover where she came from. We follow her, the people in her past, and her granddaughter after her death, as the book weaves its sad tale. 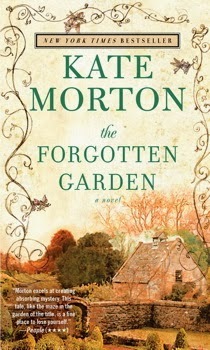 Bonus props to Morton for writing some truly beautiful fairy tales for her Authoress character. I would read an entire book of these. Moving on, I am now reading the second book in Alex Grecian's Scotland Yard's Murder Squad series. I won a lovely hardcover copy of Grecian's first book, The Yard, a couple summers ago. Coincidentally, Grecian is a fellow Kansan - he's from Topeka - and a theatre friend of mine tagged his father, another theatre person, on my "omigosh, I won stuff" Facebook post. You would never guess some guy in Kansas wrote these books. They take place in Victorian England, post-Jack the Ripper, and are darkly atmospheric crime novels. I am about halfway through this one, and I recall the greatest strength of The Yard: its dry sense of humor. There is some wonderful dialog, and the humorous lines are so subtle the humor could easily be missed. Looking forward to seeing where this one is going! I can't find a trailer for it, but here is the trailer for The Yard. I have several massive stacks of holiday books from the library, and I plan to feature some Thanksgiving and harvest-themed titles next week. I have Christmas stuff swirling like sugar plums in my head, but I will not do the Christmas (or Advent!) thing until Thanksgiving is over and done. I will say, I've found some goodies! 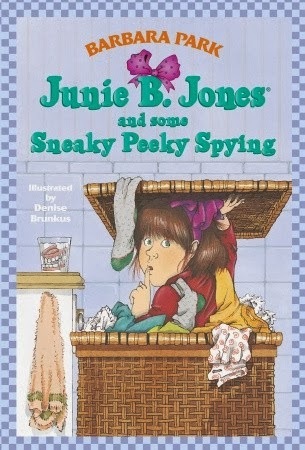 I must get some Junie B Jones - I keep hearing about them and never just doing it! And now I want The Yard and the peach one too. Actually, instead of parking myself on the couch (its almost ten pm here) Im going to get onto the library website and order them. They prob won't have Junie B though, sadly. Have a nice weekend! Junie B. is just a very funny series. Junie B. isn't a good girl - she gets in trouble a lot - but she's very real and lovable. It's a favorite early chapter book series around here. My oldest progressed to them after getting comfortable with other series first. Junie B. is the narrator, and she misuses words and makes funny grammatical errors, which can confuse a beginning reader. Once the kiddo is used to her way of speaking, however, watch out! I'm reading Housekeeping, and we just finished. Fortunately, the Milk by N. Gaiman. Hilarious. Housekeeping not so hilarious but amazing nonetheless. Thanks for the recs! I haven't read Housekeeping. I haven't read any Marilynne Robinson, in fact, although her books are always on my someday list. It's so cold right now, I plan to binge-read this weekend, if the girls will let me. Happy reading to you! Look at all those great books. I love SAA and Alice too. SAA's writing is more whimsical I think. I loved The Girl Who Chased the Moon. I can't believe I haven't read The Peach Keeper yet. I agree that Alice Hoffman is darker. SAA has that whole southern vibe going, too. Both have books coming out early next year, so I am very excited! I really loved The Peach Keeper! That's Little Sis's owl mug. I got an owl mug from the cafe at the bookstore years ago, then Big Sis got one a few months later. Little Sis never got one. The grocery store was selling these before Halloween. They are a different design, but it made her happy. Today she told me she needs to get Daddy an owl mug for Christmas, because he's the only one without one. I don't think he minds, but he'll love the sentiment. I haven't read A Series of Unfortunate Events yet! I owned three of the books (not the first three), as I scored them as very cheap bargain books. My intent was to start buying the rest, but my sister beat me to it. I gave her my three. I'm a softy. wow you are on such roll here! wait, are you selling your pumpkin bread? that's SO COOL!!!!! i just read that Betsy Tacy Tib book the other day.....to myself! I love those books so much. They are SO cozy! So excited for new Addison Allen book, or is it Allen Addison? I'm too lazy to scroll up. Pretty lazy huh? I was wondering what you were up to with all those loaves of bread! Very cool! I'm reading Allegiant... finishing the series off and I've heard all about people being upset about the ending (I read you and Melissa discussing it) but I refuse to listen... I'll know soon. very soon. ;) All the novels you've shown here look intriguing! Thanks for the bad kitty link back to us :) You're the best!